Christopher Vogler builds on Joseph Campbell’s works in this book. Campbell had originally written The Hero with a Thousand Faces in the 1940s, detailing a theory that every story ever written had the same basic structure, dubbed the “monomyth theory”. 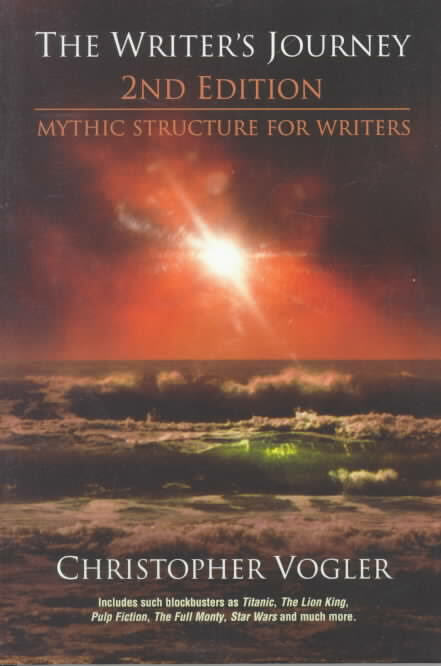 Vogler builds on this idea, taking it and making it into actual writing advice for new and experienced authors, breaking down the so-called hero’s journey into easy-to-follow steps as well as providing archetypes for the types of characters that the hero will run into over the course of the narrative arc. I was first introduced to this book in a class I had in college, where we had to write and present a book report on a writing advice book chosen from a selection the professor had on offer. I grabbed the third edition of this book and read it with as much gusto as I could, but ended up only getting about halfway through, relying on cliffnotes and skimming for the report. My second exposure was far more pleasant. It was in a community education class offered through a community college. The professor there only made a passing mention of the book, focusing instead on the content and presenting the ideas and arcs without Vogler’s weird, unsuccessful attempts at non-gendered language. The most value the book has for me is the examples it uses. Breaking down popular media into the parts and showing how it fits into the narrative arc made the material accessible and easy to follow. Over all, I ultimately think I like the content of the book more than I like the book itself, but what can you do?